Welcome to the first review of Mermaid & Myth Month on Bookish Lifestyle! In the concluding sequel to Merminia, Ulric and Selinne are both about to find out just how much they stand to lose. Upon seizing Dencur with Adessia’s ring, Ulric leaves everything beyond the city walls in chaos. As Selinne tries to save Merminia from ruin, she finds a hesitant group to aid her in the perilous journey to Dencur. But while Selinne works to stop Ulric from destroying all that she holds dear, friendships are tested to their breaking point. The final battle is brewing between Humans and Enchanteds. The more I lose the harder I want to clutch to what I haven't lost. But he's not necessarily mine to hold onto. I hold onto my bracelet and my pride instead. And I let him walk away. Instead, I lie there helpless in bed. I watch the irregular beating of her chest under the sheet. My shame is the only thing to keep me company when she falls asleep. I wanted so desperately to see Ulric miserable, to trade his torment for my own. I thought maybe his suffering could lesson the ache of missing Bayren. But as I held Ulric beneath the tree, his pain proved to me that anger is a poor medicine for a broken heart. I might have saved myself from all my wasted spite. Anyone can hold onto revenge, because hate is easy. That's what makes love so extraordinary. Emm Cole is basically a wizard of fantasy worlds. What made me fall for her writing was what so often draws me in: mermaids. To top off her creative genus, she created an entire underwater world with detail. Each group of Mers have their own traits, their own way of life particular to where their boundaries are. There is also the fact that they are not all happy with their lot in life and want more (isn't there always someone that wants more). Being the second book in this duology, the plot is set and the book just takes off. This book was not really centred in the beautiful and sometimes terrifying underwater world like Merminia. 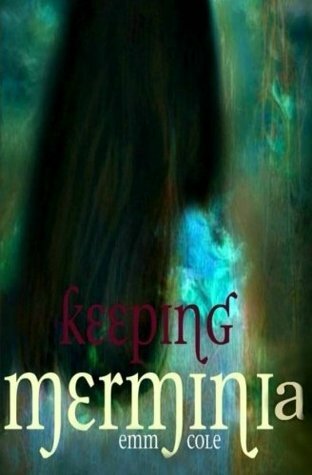 Keeping Merminia was a fast paced read that took place more above, on dry land. It made me miss the beauty of everything in the ocean, but Cole did a fantastic job of crafting the world above. There is an entire new world filled with new wonders and magic. Layer this with the fact that the pace picks right up and never stops, and you have a read that you will have a problem putting down. Selinne is still an amazing character. She never fails to amaze me with her strength and ability to learn and grow. I was worried that her need to exact revenge would ruin some of what I had come to love about her. However, it was in this that she learned that it isn't exactly what it's cut out to be. This is the girl that has had so much thrown at her and taken away; and yet she still pushes on and holds her head high. When I thought she had reached her peak for growth, she only became more than that. She remained flawed but as always it is the flaws that often make a character that much more believable. I can't say that I have ever felt so complete when it comes to characters and the way everything came back around or how things turned out in general. I will admit I went through a bit of readers rage about the end. I mean COME ON!!! I was spun, but upon talking about it and thinking about it the end made sense. There are some characters that I would love to know how they ended up, but honestly I was too busy being happy to think about until this moment to even consider them. There are also characters that I would have never thought I would be sad about their end or even miss but I did. This is just another way that Cole is all kins of amazing, bringing feelings where you thought there would be none. If you want a wonderfully crafted and beautifully written original mermaid read the Merminia duology should be on your to read list. Both books will grab at your imagination and you will easily find yourself submerged within the pages. Merminia and Keeping Merminia easily make my favorites list, and I have no doubt if you are a fan of mermaids or mythology they will make yours too! of both Merminia & Keeping Merminia to one lucky winner. MUST be able to accept the e-books from Amazon. Good Luck!